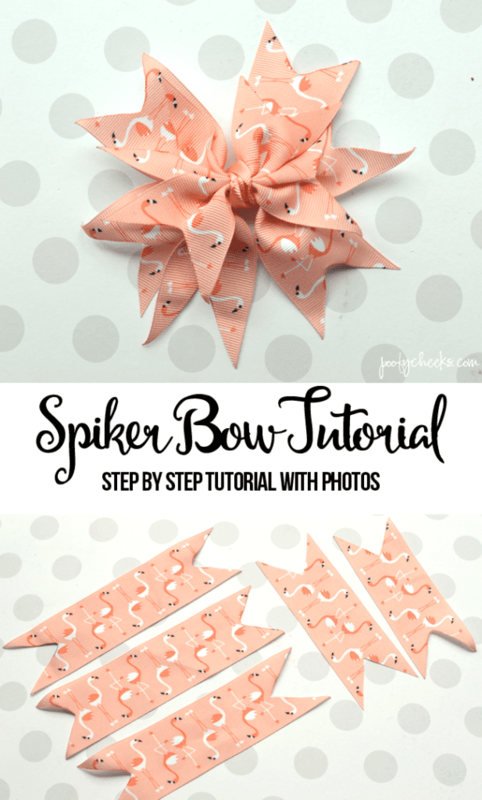 Easy spiker bow tutorial with step by step photos. This post contains affiliate links and we receive a small commission if you make a purchase. My sweet girl is three and a half now. She went through a stage somewhere around the start of terrible two where she wouldn’t let me put anything in her hair. Then terrible twos hit hard and I could barely get a brush through her birds nest of hair. Finally she is coming back around to the idea of cute hair bows. Headbands… forget it! If this sassy lady is willing to wear bows trust me I’m taking advantage. Do you know the feeling? Last week I ran into Hobby Lobby for some shop supplies and for once the two babies were behaving and I was able to browse a little instead of rushing in and out. I wondered into the ribbon isle where they had 50% off and came across the cutest flamingo grosgrain ribbon. It HAD to come home with me and I knew it would make the cutest bows with Spring and Summer knocking. 1. Start by cutting your ribbon. 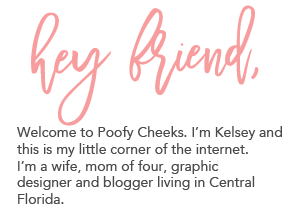 I find some of my favorite ribbon on ETSY when I’m looking for fun and unique prints! You will need (3) 6 inch and (2) 4.5 inch pieces of the 2 inch grosgrain ribbon. Cut (2) 8 inch pieces of the 1/2 inch ribbon. 2. Cut a triangle from each of the 2 inch wide ribbon pieces. 3. Use a lighter to quickly run across the raw edges of the ribbon. This seals the ribbon from fraying. 4. Pinch the middle of a 6 inch long ribbon peice between your thumb and pointer finger and then use your other hand to fold down the two ends between your fingers as well. Repeat with all three 6 inch pieces. Secure by tying around the middle with string and knotting. (See the 4 pictures below). 5. Repeat step 4 with the two 4.5 inch long pieces. 6. Place a dab of hot glue on the middle of the bigger ribbon cluster and secure the smaller one to the top. 7. Take one of the 1/2 inch wide pieces of ribbon and hot glue it around the outside of a metal clip. You can skip this part but I think it makes it look more polished. Remember to use the lighter to seal the raw edges of the ribbon. 8. Take the second piece of 1/2 inch wide ribbon and find the middle. Place a small dot of hot glue onto the inside of the clip and then secure the middle of the ribbon to it. 9. Put another dab of hot glue onto the bottom of the bow and secure the clip to it. Then wrap the ribbon around to the front of the bow and make a knot. 10. Wrap the ends back around to the back of the bow and place another dab of glue on the inside of the clip and knot again over the glue. Clip the ends and seal with the lighter. Ta-da! 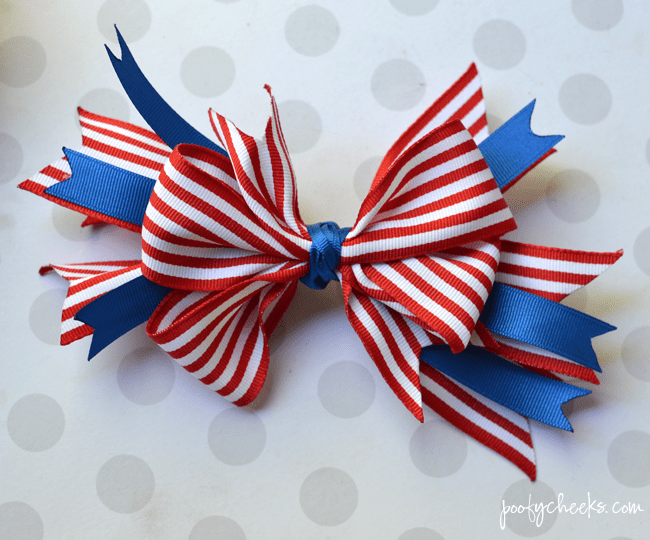 Your first one might take a few extra minute but these bows take minutes to make! You can roll these out like a factory! I clip these right into Delilah’s hair and they look super cute over the top or under a bun. If your little girl does wear headbands you could always clip the bow or hot glue it right onto a band as well. Ready to try your own!? If you enjoyed this tutorial we have another boutique bow tutorial you’ll love. 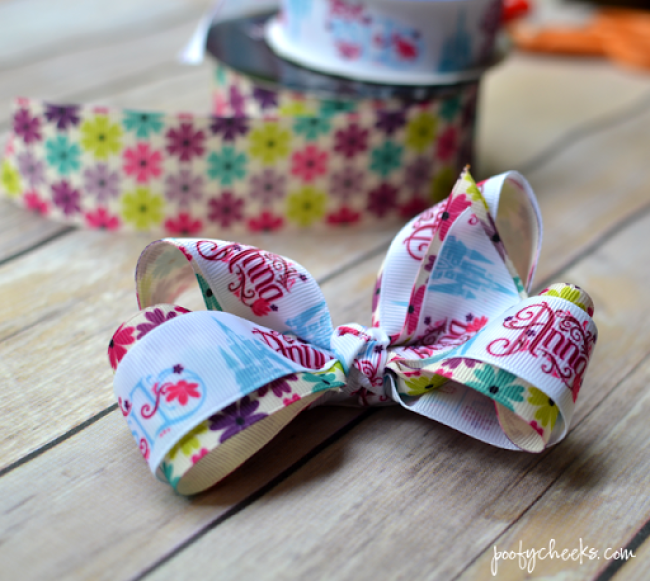 Get the step-by-step instructions on the DIY boutique bow shown below. Combine the two for a layered boutique bow. would wire ribbon work for this?